In my page Testosterone and Weight Loss, I discuss how men can profoundly increase their testosterone - sometimes double or even triple it - through weight loss if they have ~ 75+ pounds to lose. And considering that one third of the U.S. population is obese and another third is overweight, many men fall into this category or darn close. Of course, the tragedy is that few men understand what a powerful and positive impact weight loss can have on their hormone levels. 1. Study: Healthy Versus Thin Controls. Lets start with a study of obese men versus thin healthy controls. The researchers found that "serum estrone (E,) and 17 -estradiol (E2) were noted to be 2-fold elevated in a group of morbidly obese men." 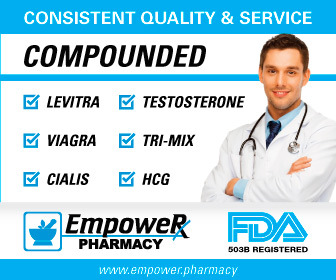 There are actually three primary estrogens in men and the most powerful of the three is estradiol. The same study also found that the obese men had average testosterone of 348 ng/dl versus the 519 ng/dl of normal men, which is about a 33% reduction in testosterone. Furthermore, some of you may recognize that 348 number: it is the exact threshold at which LabCorp defines hypogonadism in adult males. Basically, these men, by putting on all those extra pounds, drove themselves into a hypogonadal state. The tragedy is that very few doctors will explain just what all those extra pounds do to a guy and will just give the man Cialis if testosterone is high enough or put him on HRT (TRT or testosterone therapy) if it is low enough. --The testosterone-to-estradiol ratio increased by 72% from 11.1 to 19.1. "In conclusion, increased circulating estrogens and reduced androgen binding were found in moderately obese men, which were completely corrected with weight loss.."
Of course, I would guess many of them could have lost a bit more weight and improved things even furthermore. Some of you may be thinking, "22% is not that great. Why not just take Arimidex?" First of all, I have seen even greater drops on the Peak Testosterone Forum. In fact, the way that I would word it is that, if you drop your body fat percentage down to around 15% - yes, what you were (hopefully) in high school or college - your estradiol levels will fall right back to youthful levels. In other words, skewed estradiol levels are not so much a function of aging but just the weight gain that occurs so often with those in Western societies. And the other thing about Clarence is that he has proven his program works well into his senior years. He is still has a great physique, energy and respiratory fitness in his late 70's! If you are interested, see my pages Clarence Bass: Challenge Yourself, Clarence Bass, Senior Bodybuilding and Clarence Bass: Ripped for more information. 1) J Clin Endocrinol Metab. 1979 Apr, 48(4):633f , "Increased Estrogen Production in Obese Men"
2) The Journal of Clinical Endocrinology & Metabolism, Published Online: July 01, 2013, 53(4), "The Effect of Weight Loss on Reproductive Hormones in Obese Men"